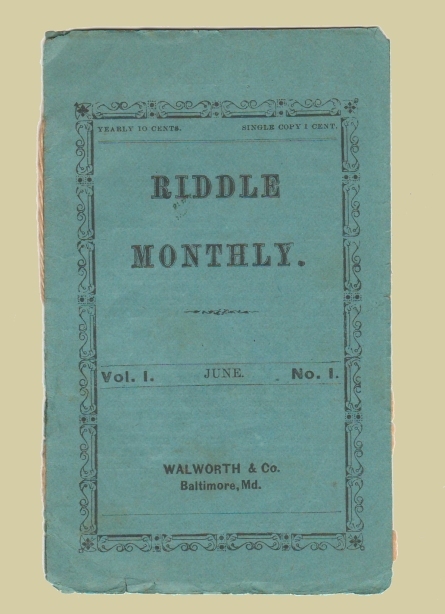 Riddle Monthly. June, Vol. 1. No. 1. Baltimore, Md. : Walworth & Co., nd. (188-?) 12mo., orig. blue printed wrappers, stitched, 8, (4)pp. ads for Baltimore businesses. Light edge wear, spine partially split, otherwise a near fine copy of a delicate item. We have found no record of this publication anywhere. The wrappers indicate that children could “make money fast” by enlisting subscribers in “clubs” at a rate of 10 cents per year; a club rate would be established based on the number of subscribers, and the child would then keep the mark-up. Curiously, only two records for Walworth & Co. are listed in WorldCat—a single piece of sheet music, and a book titled The climate of the eastern shore of Maryland.